The divorce of two parents introduces a substantial change to the life and routines of a child regardless of their age. Being confronted with the loss of the stable home base, the daily absence of one parent, having to commute between two different households, and experiencing the financial strains of living in a one-income household, all of these aspects of a parent break-up shape a challenging new path for the entire family. It’s a whole new chapter for everyone. Life after a divorce will be significantly different from life as it was before. An adult will generally be an active part of the decision-making process, and may also come to terms with the loss of a marriage before it is officially over. For children, processing mostly only begins after being told that a divorce is happening, and may feel sudden and earth-shattering. Very often, parents who are considering a divorce address their worries with us in counselling. Will the kids resent us for making them go through this? Are we setting a bad example that will discourage our children ever to commit to someone or get married in their life? Will they act out in school? These are all natural concerns, but they may not all come to play for your child. Every child’s coping mechanisms are different just like their characters are. Individual family dynamics and a kid’s dependency on their parents as well as their ability to speak about their thoughts, worries, and feelings play into how the post-divorce phase will go. Below are a few effects we’ve seen in children in our practice and are happy to share. We hear this over and over from children of divorced parents. However, it is something that most parents are largely unaware of. Children whose parents have shared custody or a weekend visitation schedule in place often suffer from one parent speaking poorly and disrespectful of the other. Whether it is name calling or more subtle digs, bad-mouthing will affect your child immensely since they feel loyalty and love for both parents. Some kids will personally feel hurt by these hateful comments since they know they are half of one and half of the other parent. This is almost a taboo aspect that many of our clients have a hard time admitting in front of their parents. A lot of young adults, however, say they spent most of their teenage years hoping their parents would split because the energy and family dynamics were so destructive at home. Children at any age can struggle with their parent finding a new partnership. It is usually best to introduce new partners after your relationship has been established for about a year. This is enough time to know whether the relationship is transitional or permanent. Many children tell us how they struggle to trust the new person. Some report that they feel it is a betrayal to the other parent if they like the new person. This process can be navigated with constant open communication and the support of a therapist. 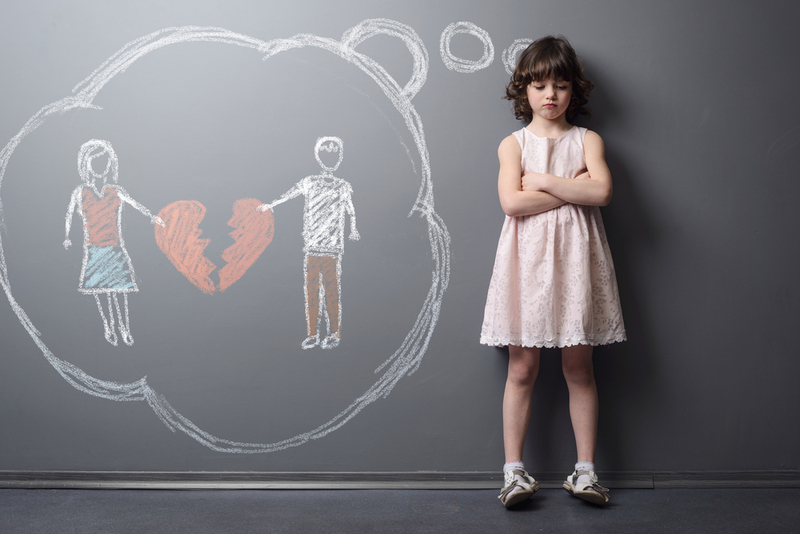 Despite the process of the divorce being distressing at first and the adjustment to a new reality feeling hard, seeing their parents dealing with the split well can be a great lesson for your children. Witnessing the personal growth, success and newly found happiness in a parent’s life can be a great benefit for them as it grows their optimism in life and decreases the fear of change. Going through divorce is never easy on the parents or the children. Family counselling can equip you with the communication tools and skills to navigate this difficult time period, opening dialogue and facilitating deeper connections. Vaughan Relationship Centre specializes in helping families with adolescent or adult children in address topics like separation or divorce in a safe, comfortable environment.